The Miracle Peeler will help you with all of your peeling needs. This is a dual blade peeler that lets you peel with one side and julienne with the other. The stainless steel blades are strong enough to cut wood - talk about durability. Miracle Peeler lets you peel layers that are thin enough to read through. Using this peeler requires little effort and it will save you an immense amount of time - say goodbye to waste and peelers that move in one direction. Peeling fruits and vegetables causes a lot of waste - not anymore because Miracle Peeler lets you remove just a thin layer of peeling. The blades are strong enough to peel the toughest fruits and vegetables including pineapple and butternut squash. On the other hand the blades are gentle enough that they can gently remove the outside of a tomato. The cost of Miracle Peeler is $14.99 plus $7.99 shipping. The special TV offer allows you to receive a second Miracle Peeler by paying the extra shipping fee of $7.99 for a total price of $30.97. 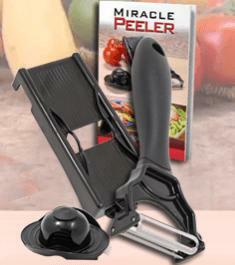 Miracle Peeler is extremely safe to use thanks to the rubberized non-slip handle. This handle ensures you have a good grip, so you always have control of the peeler. You will also be provided with a recipe guide that gives you amazing recipes which all require Miracle Peeler. To answer even more of your kitchen needs you will also be provided with a mandolin slicer. All you have to do is clip Miracle Peeler into place, use the safety guard and starting slicing anything in your refrigerator. Use Miracle Peeler to peel all of your fruits and vegetables. It can be used to peel: potatoes, apples, carrots, onions and so much more. Create the perfect coleslaw with Miracle Peeler because the blade will also Julienne all of your ingredients. Miracle Peeler can also be used as a slicer. Use it to slice veggies and cheese. The secret behind this product is the dual sided blade which allows you to both peel and julienne just by flipping it over. It works in both directions which lets you peel faster. This cuts your time in half because it works when you are moving it up and down. Choose the side of the blade you are going to need. This will depend on whether you want to peel something or julienne it. The next step is to place the blade on the vegetable. Glide Miracle Peeler up and down your fruit or vegetable and you will be finished before you know it because it works in both directions. No, where you put the blade does not matter. Since Miracle Peeler works in both directions it does not matter if you start peeling at the top, middle or base of your fruit or vegetable. Yes, Miracle Peeler is dishwasher safe. The mandolin that also comes with this product is dishwasher safe too. This makes for a quick and easy cleanup. Since the product is dishwasher safe you do not have to worry about cutting yourself while cleaning the blade.